TransTel's DK7-D is an attractive desktop or wall mount telephone set which operates with the TD or TDS Series telephone systems. Elegant and stylish with two tone colors, the DK7 series Digital Key Telephone meets all needs of todays office environment. 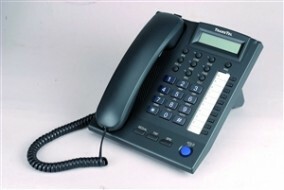 The DK6-18D phone would hold a place on the desk of any busy executive, or anyone who desires a top of the line telephone. The DK Series are easy to use and provide ample keys for one touch access to system features. The DK6-D is equipped with 18 programmable keys (CO, Extension, Functions and Speed Dial) with dual-color LEDs and 8 functional keys. It provides a high quality speakerphone for handsfree operation, a multi position desk stand for adjusting the set to various angles on your desk, a thoughtfully designed backlit LCD which is standard on both the DK7-6D and the DK7-D models. Hot Dialpad means you can place calls both internally and externally without having to life the handset. The telephone is also equipped with a wired headset jack. A large LED indicates incoming rining as well as voice messages left in your mailbox.